Last night started like any normal night. Caelen went to bed, as usual. Armed with his cuddly toys, we was asleep in no time, as usual. A quick dinner and a change of clothes later, and I met a friend for a nighttime walk and a natter. So far, so normal. Until I got the text. The power was out. Not just in our house, not just on our street, but almost half the town. I will admit, I panicked. I had 14% battery on my phone, and I have a really bad habit of having little to no battery on my laptop at any given time. Instead of conserving my phone battery like any rational person would, I took to Twitter and Facebook. You know, being a social media addict and all. All the while, the walking beard gathered supplies. 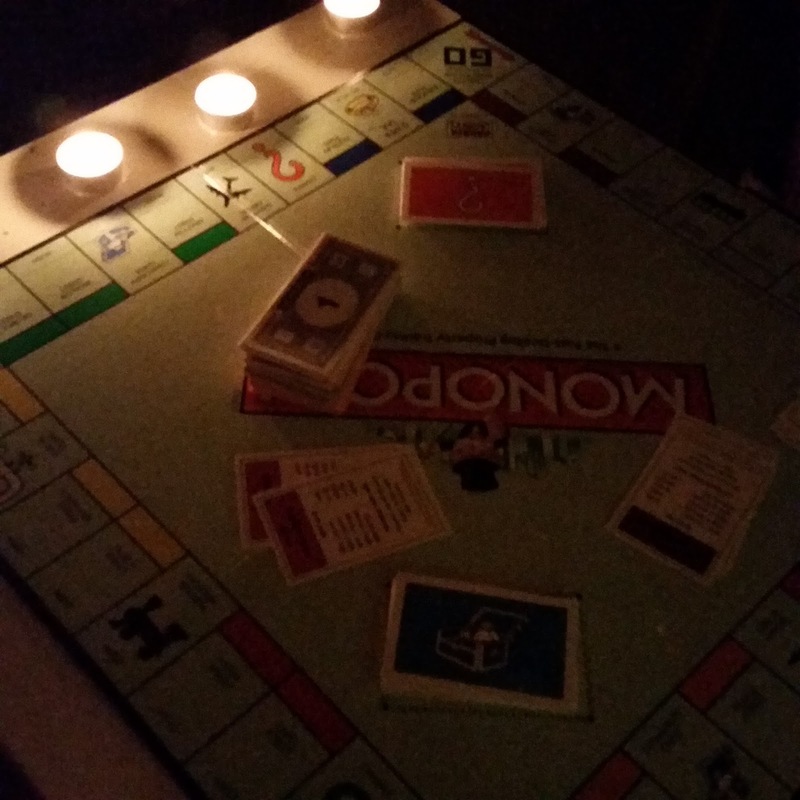 Candles, battery operated fairy lights, drinks, Monopoly. Yep, Monopoly. Not being a huge lover of board games, I'd never played it before. And so, with such a rosemantic setting, we played a vicious game. Or you know, as vicious as teaching me how to play Monopoly can be. Until halfway through the game, when the power came back on, Caelen woke up, and I decided my back was too achy to plough on through the game. But it did make me realise how much time I waste every night. Scrolling through newsfeeds and timelines, reading crap online, playing games on my phone (FYI - I'm currently obsessed with Little Alchemy and Fallout Shelter - try them, they're fun!). I think a technology free night is in order once a week or so. Just to plug out of social media, and enjoy the simpler things in life. Like reading a book, or finishing some crochet projects without distraction, or another board game. Or you know, building a fort and camping out for a few hours. Which sounds pretty good right about now.